The day has come. Today we’ll arrive at Desert Trip Festival in Indio, California. After several days’ road-tripping across the United States, Stefan and I wake up in our hotel room in Twentynine Palms, about an hour’s drive from Indio. We’re fairly nervous at what Desert Trip might bring; the line up – which includes The Rolling Stones, Paul McCartney, Bon Dylan, Neil Young, The Who and Roger Waters from Pink Floyd – is unique in music history and promises a second Woodstock. 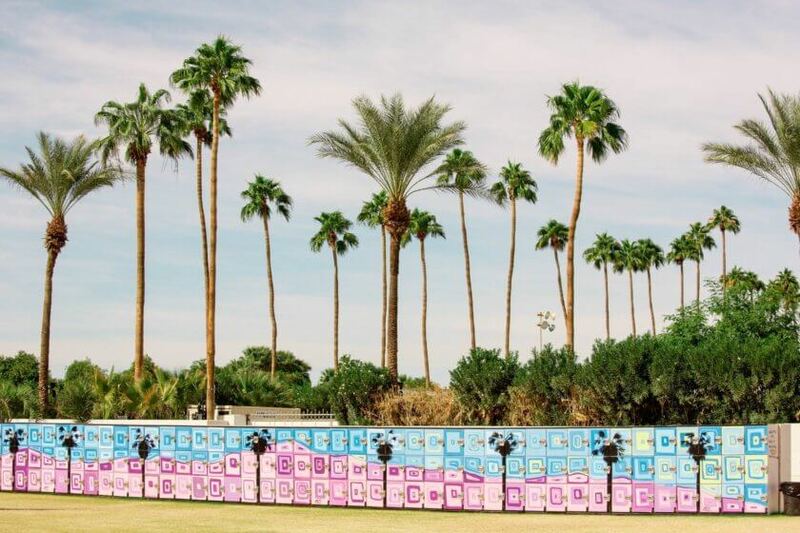 The festival is located at the same place as famous Coachella festival, hence it has already been named Oldchella. Not only due to the – let’s say – “experienced” bands, but most likely parts of the audience as well. At 9.00 am we are driving into the broad Coachella Valley. 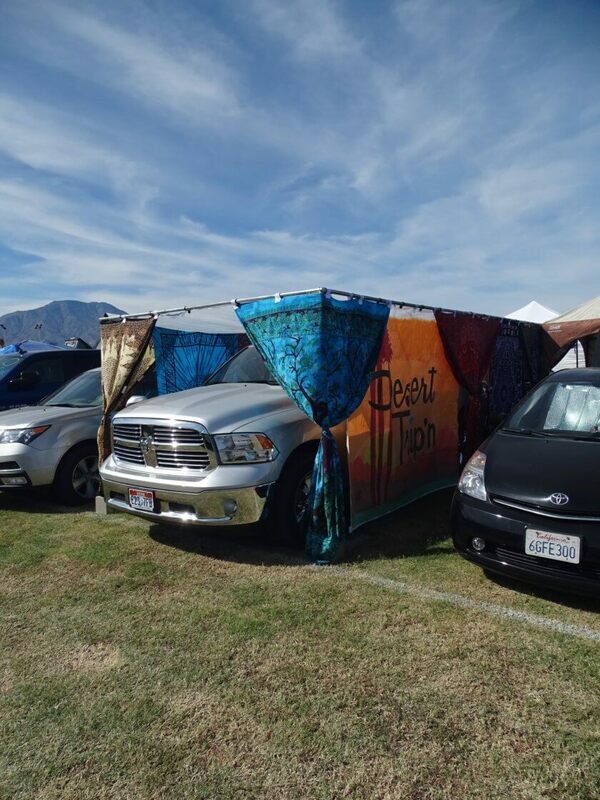 The Desert Trip staff welcomes us smiling broadly: “Hey guys, you are the youngest people so far.” Moving towards the campground we are accompanied by a variety of music lovers ranging from young metal fans to aged hippies from all over the world. On arrival at our camping space, Stefan and I are instantly involved in a conversation by our neighbors. Melody und Steve are from Fresno. Both 50-odd they have five grandkids with the sixth on its way. Immediately, they are caring for their younger neighbors as if we were their very own family, offering Melody’s home made jerky, ice cold beer and helping set up the canopy. To our right, three young campers with Led Zeppelin shirts and a Pink Floyd sunshade have nested. 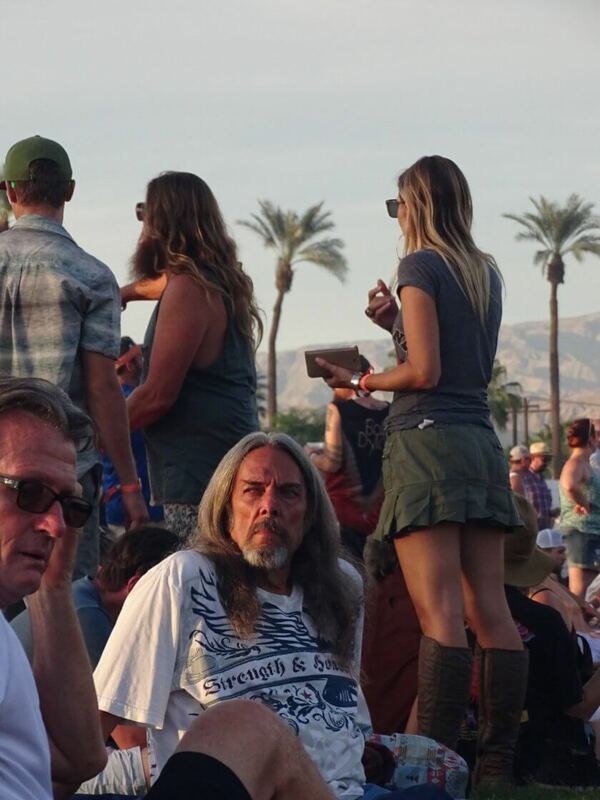 Just across from an aged hippie couple from Texas sits a man that Stefan instantly nicknames ’The Captain’. He is proudly wearing his big white captain’s hat. Next to the rainbow flag already flying he is just about to hoist another one saying ’No Shoes Nation’ – emblematic of the way that everybody is creating their own little realm for the next few days. Music is playing and you hear three songs in parallel. Tables, chairs, and barbecues are arranged on cosy carpets. Some revellers have even forgone their tents and will sleep underneath the open sky for the duration of the festival. The scent of weed starts to fill the air as temperatures rise to 37 degrees Celsius. We spend the day chatting with people and strolling around the campground amidst huge RVs, tents, and pick-ups. 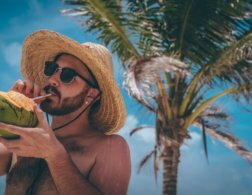 People are having laid-back BBQs just as if they were home on their backyard verandas. Parents or even grandparents tell stories from former days. Dads play football with their kids. A hippie chick in her forties explains her healthier way to smoke weed. An aged man with long hair explains how he left the USA years ago – he’s living in Costa Rica now, making music he uploads onto YouTube. Altogether, we are all listening to the Stones’ rehearsal in the distance. “Those eight songs alone have justified my festival ticket!” The young boy standing next to us is overwhelmed. Later on, everybody prepares for the big show. 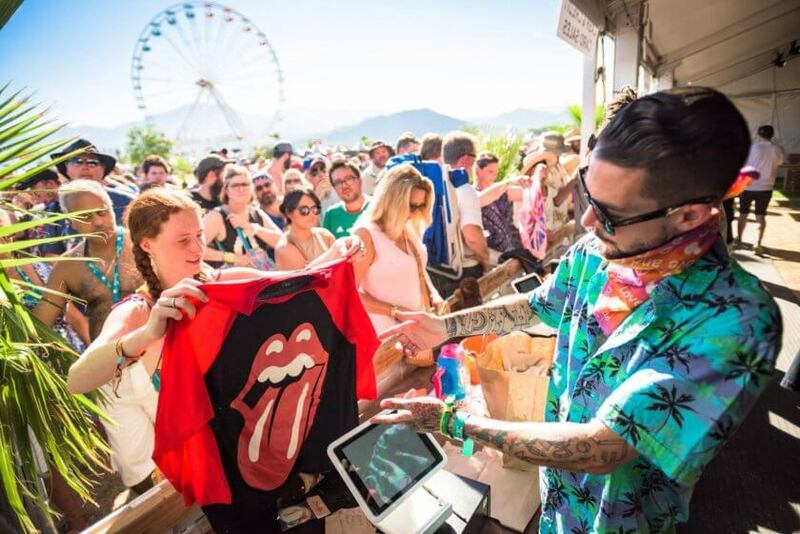 Recently bought Stones’ shirts are donned, as well as those from 35 years ago. A very aged man with crutches crawls out of his tent. A smiling lady is braiding her hair – later we are told that she is already 81. Then it’s time. Doors open to the infield. The guards welcome us with a high five and a very warm “Welcome to Desert Trip, madam!“ Madam? I have never been greeted that way on any other festival I’ve been so far. 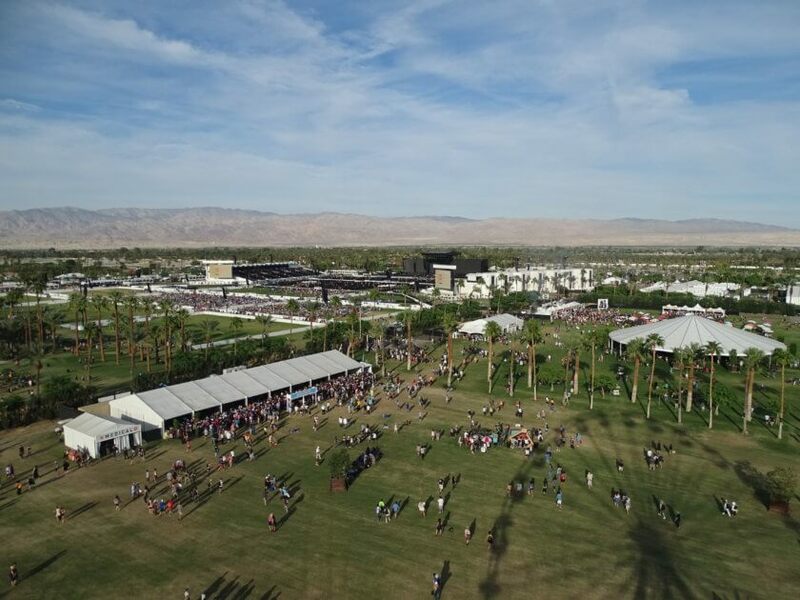 The infield itself is huge, framed by tall palms trees; Stefan and I take a ride in the ferris wheel, with its breathtaking views that have been immortalised by the famous Coachella festival. In a vinyl store we are happy being among other lovers of tangible records in a time of digital files and music streaming. Call it old school, but to us, this is authentic. A photo exhibition nearby reveals one-of-a-kind pictures of the Desert Trip artists; my favorite is the one showing the young Paul McCartney and Mick Jagger sitting in a train at Euston Station. What must it have been like touring with these bands in the Seventies? I think of all the stories these photographers could tell. I guess some of the older visitors could also add their memories of those wild days when music history was being made. In front of the stage the mood is donnybrook, yet calm. People are eating, laughing, drinking. Mums carry their young kids. Coachella girls pose for selfies, wearing short leather skirts with fringed tops and flowers in their hair. Aged hippies wearing a similar aesthetic, the same, minus the arty styling. In the end, nobody cares about outfit, origin or age – it’s all about the experience of legendary rock music unifying generations. Anticipation is rising at sunset; we are about to watch The Rolling Stones. Next to us there is a family – a father and mother plus their son and daughter-in-law. Like many other visitors, the son has bought tickets for his parents. Dad tells us that he’s been retired for some months now; they just moved to Palm Springs six weeks ago. He grins happily at us in his strikingly colored Hawaiian shirt. “You know, now I just lie in my pool every evening, with a drink in my hand, watching the stars,” he say. Okay, now I’m more than jealous! Suddenly a roaring voice on the stage gets full attention: “Ladies and gentlemen, The Rolling Stones!” The aged folks are sitting in the rear on blankets or camping chairs. The younger ones dance in the front. Or is it the other way round? I witness young people trying to look cool while dancing to these old tunes as grey-haired guys just move naturally – as if they’d done nothing else these past few decades. 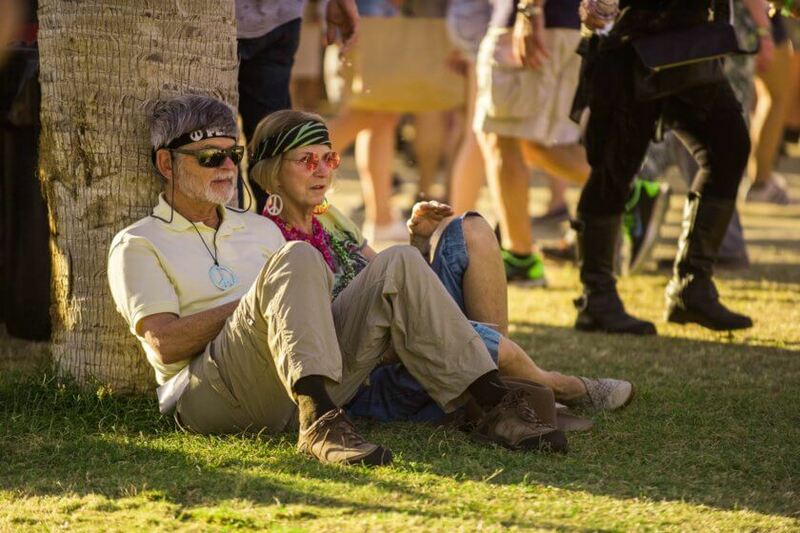 It’s an amazing experience to be surrounded by music lovers of all ages. We are still laughing about a middle-aged rickshaw driver explaining to his guest that Mick Jagger must be a vampire (as he is definitely too old to still be alive) as we make our way back to our tent that night satisfied. The next days we are living festival life to the fullest – although the dust is slowly taking its toll. Stefan and I awake coughing due to our dry lungs. We decide try the bandanas our neighbor Steve has thoughtfully bought for us. On the very last evening, an act which is a festival highlight for me comes on stage: The Who. What a feeling it must be for this band – on stage in Woodstock once and now, 47 years later, playing many of these songs again. My Generation is one of them. Is there any better tune to describe this cross-generational happening? Some older visitors have tears in their eyes as they feel themselves thrown back into youth again. For me, it’s a fitting finale to a magical experience for the audience as well as the bands. If there has been something special about the last few days, then it’s been about understanding each other better. Learning from each other. Or just celebrating life together. The next morning, unfortunately it’s time to tear down the tents and pack up for home. We are exchanging email addresses, taking group selfies and connecting on Facebook. The young ones jump-start the cars of their older neighbors. Steve gives Stefan a self-made Desert Trip button he created especially for him at one of the activity tents. Surprisingly, the campground doesn’t look like a landfill site by the end. 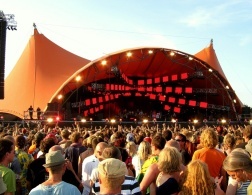 I have to admit that’s not the case for most of the European festivals we’ve been to so far! Is it due to the age of the Desert Trip campers? 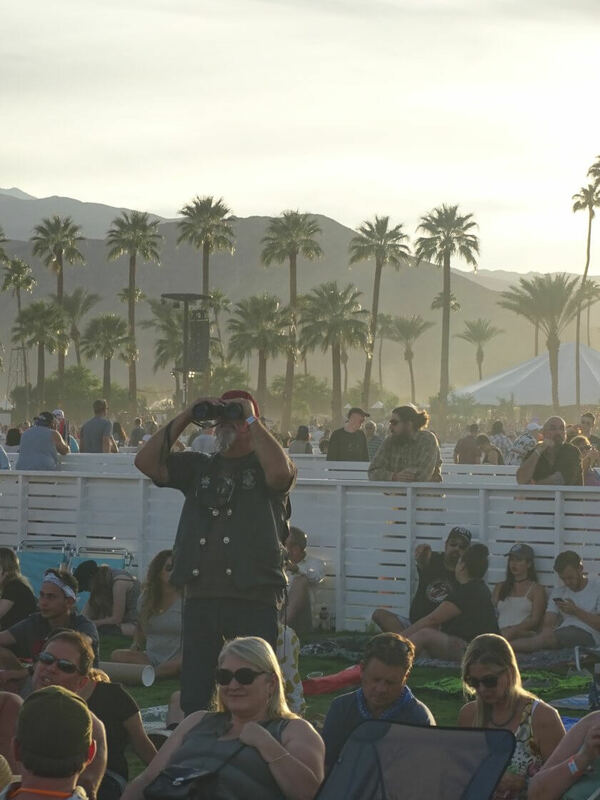 Finally, Desert Trip (or Oldchella) is the perfect alternative to the much-hyped Coachella. It’s relaxed and it’s all about the music. So grab your parents and get them tickets for the next festival. It will definitely be worth it. This is a guest post by Birgit Bachmeier. 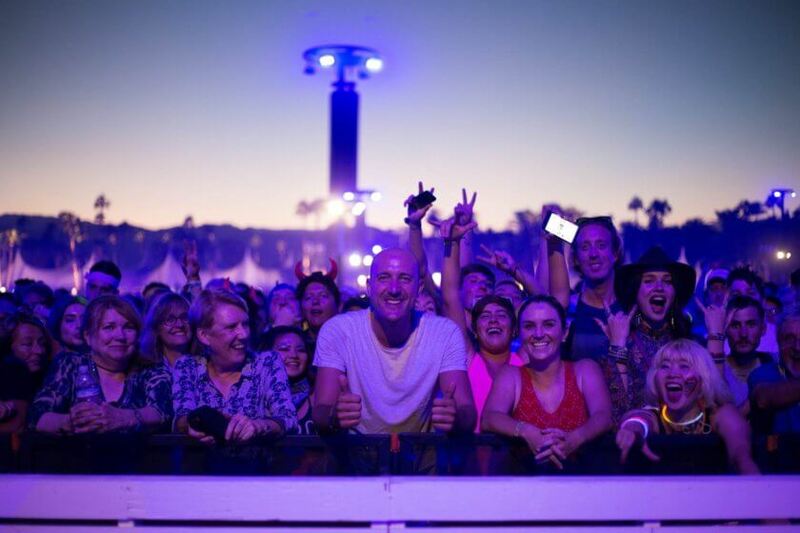 Additional photos via Desert Trip Festival. Birgit has been a passionate traveler since her twenties and has always been thrilled and inspired by exotic countries as well as nearby German mountains. 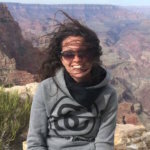 Writing about these trips, experiences and hiking tours is her personal therapy to keep all those memories alive, and it’s also a perfect balance to her job in the stressful business of fashion PR. Music is Birgit’s second passion; be it in intimate concerts, big venues or festivals, she spends a lot of money and even more time travelling the world to see her favorite bands. 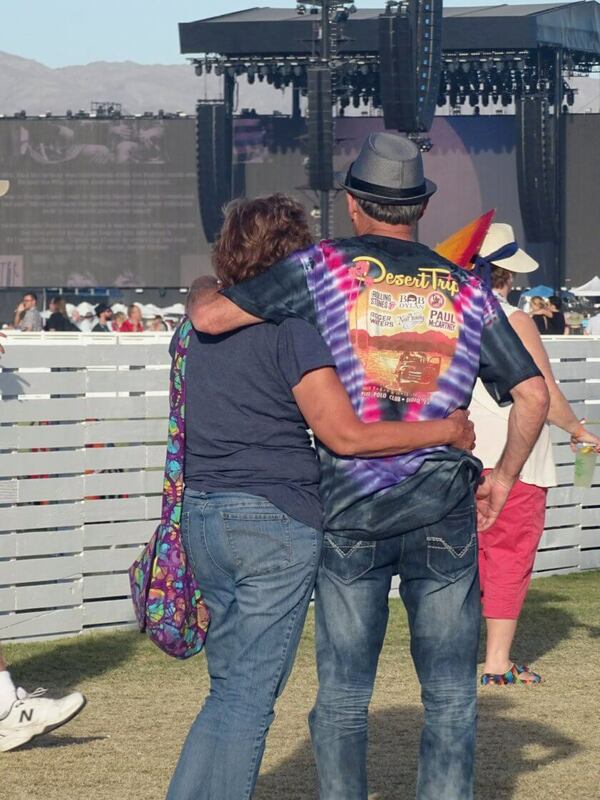 She even spent her honeymoon at a music festival. Follow her on Instagram @birgitbachmeier. I've always been so amazed at these large scale music concerts in the US. They look super fun. I'd love to see all the hippies haha! I'd definitely check out the Desert Trip if I ever visit at the right time. It rounds less rave-y than Coachella (I'm not the wild type! ).